Lisa and I cast off from Key West on April 15th. That was approximately three months ago. Time flies when you are having fun. We’ve learned a lot during this time that we figured we’d share. Here a bunch of random observations in no particular order. 1. Pick a day to leave and then do so. We heard this endlessly from longtime cruisers friends at our marina. “Just leave. It’s true. I wanted Pearl to be just so and my “affairs” to be organized before we left. If we had done so, we’d still be in Key West. The day we left, all sorts of stuff that should have caused us to postpone our departure happened. Besides that, the fridge and freezer that we thought were “must haves” were glitching. I wont go into the details, but addressing issues by staying in place would have cost us an additional few months. We are dealing with the issues that came up while traveling. No big deal. Actually, we learn more about where we are that way. When we left, I thought we could manage with just the WiFi on our laptops. That’s not true. A range extender is critical if you’d like internet connectivity. I’d been toying with the idea of installing one, but never got around to ordering the components before we left but didn’t get around to it. Fortunately, we had visitors who brought what we needed. Pretty much everything is easier to get in the US than anywhere else. Get it before you leave. We purchased a Honda 2000i before leaving the US. I thought it was just so we could charge our batteries periodically and use it for our air conditioner. We use it to charge our batteries most of the time when we are at anchor rather than running the engine. It seems to charge the battery more fuel efficiently through the shore power charger and doesn’t warm the boat. It also helps to run the AC when it rains and the boat has to be closed up. There are several thing on Pearl that have glitched. The HAM radio that was working no longer does so. The freezer that was not working now does. The Fridge doesn’t work. We have an intermittent leak that dumps water into the bilge. This is all stuff we have to address. Fortunately, we have most of the tools to do so. We used to have a small roll-up dinghy with a 5 hp motor. We now have a 10.5 foot rigid inflatable with a 20 hp motor. We love it. It has allowed us to explore areas we otherwise are unlikely to have explored. It also helps when there are guest. Pretty much everything eventually gets transported in the dinghy. That means it gets wet. Dry Bags are nice as they keep things, well, dry. Shoulder straps on the same dry bags are nice as they make lugging groceries and laundry back to the boat much more comfortable. People seem to like spicy food — particularly curry. We’ve made several friends and either served or been invited to several dinners that have been around curry and spicy. Pack more spices than you think you need. You will use them and they are hard to find en route. I am not sure how much more I can say here. 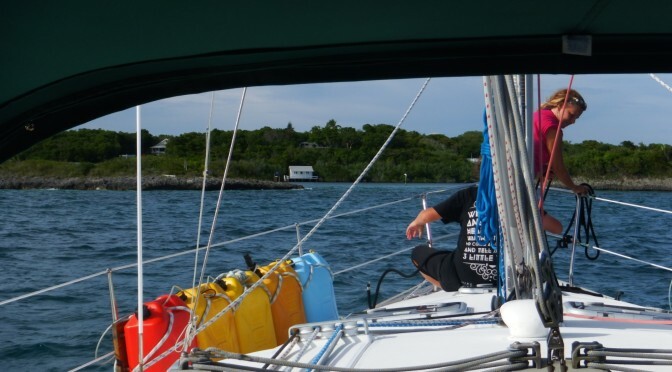 While we did spend time on a mooring ball in Hopetown, and make a bunch of friends there, this was mostly so that we could get decent WiFi service without a range extender. Since then we’ve been mostly at anchor and have loved it. We touched bottom coming into Bimini, and we’ve run aground other places that we were supposed to have enough water under the keel. Things change, sand bars shift, shoals may not be quite where they are supposed to be. Use your eyes and the charts as guidance. Blind reliance on the chart plotter has got us into trouble. When you are in the US or at a dock, water, food, and fuel are easily available. You don’t think about it. It goes on your bill, or you just run a debit/credit card. Cruising outside the US we’ve become acutely aware of how much of what we are using and where we can get it next. This is also true of waste. These are some of our observations. We’d love to hear yours!